For the entirety of the last weekend all of our senses were bombarded with the sounds, lights, colors, futuristic, and yesteryear-inspired shapes that were radiating from hundreds of synthesizers, and other electronic music devices collected together in a convention center here in Burbank, CA—the first ever iteration of the trade show event Synthplex. Manufacturers showcased some of their new products, artists performed their synthesizer-infused music, multiple talks from industry professionals provided inspiration and set the overall meet-and-share tone for the convention. And this wouldn’t be nearly complete without many die-hard synthesizer enthusiasts who were there to take in all of what was offered and spread the joy around. Now that we are back to our normal lives, we’ve decided to put our impressions together and share with you some of the exciting products that we’ve spotted over the weekend. The Canadian manufacturer was showcasing a few new products, one of which is the much anticipated Tête, an expander module for their excellent Tetrapad touch controller. Tetrapad itself is a densely feature-packed multipurpose module, and to this day it was one of the best options for the expressive gestural control in the Eurorack format. Its morphing interface lets it be anything from a bank of faders or stored voltages to eight independent LFOs, to a chord generator, and more. Tête expands on these features, and also adds a little screen to the interface to help users navigate and manipulate the complexity that comes with something that powerful. The expander adds tons of new features, many of which are designed to accommodate the polyphony. 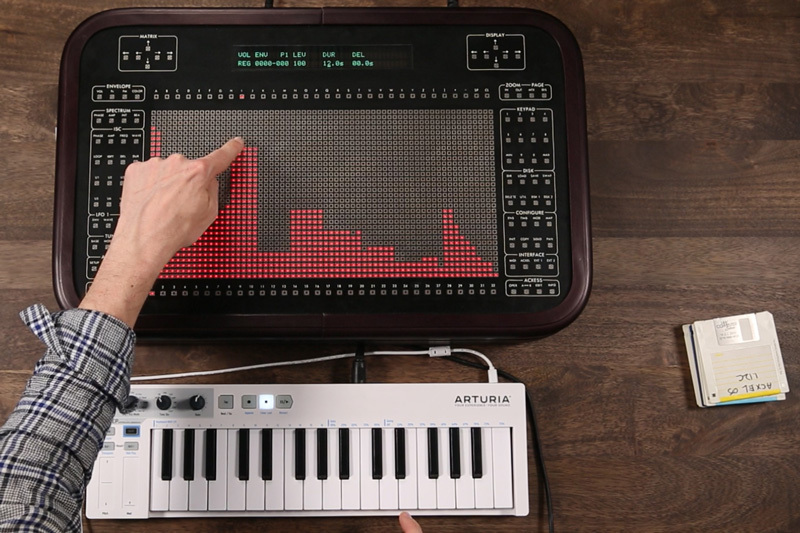 One application of Tête turns Tetrapad into a very capable sequencer. Another product from the manufacturer that caught our attention is the line of new Palette cases. These 62HP 4U enclosures are designed for ultra portability. Like their larger siblings, they come in two colors: silver, and black. Palette cases also feature an additional utility row on top equipped with buffered multiples, a USB B slot, and a dedicated output. 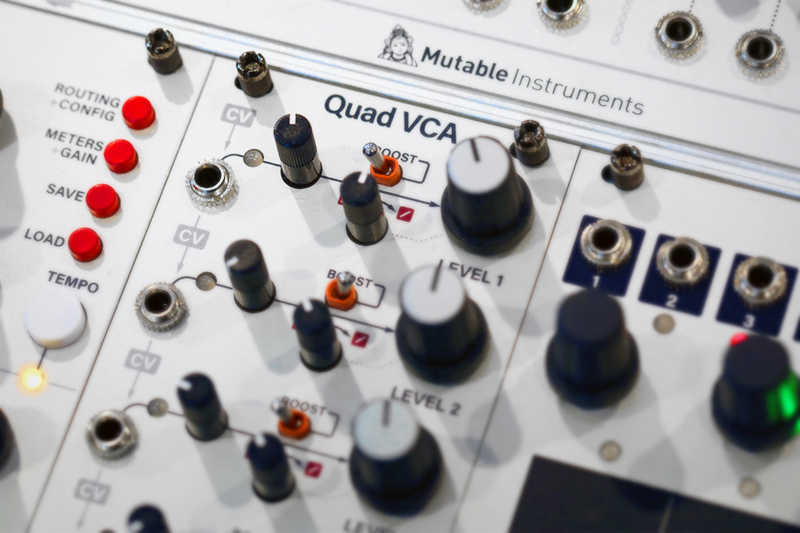 Finally, there is a Quadrax—an evolution of the Intellijel’s quad envelope Quadra module. The design bridges together the previous Quadra, and its expander modules into one, effectively reducing the total HP size. Additionally, there is a CV matrix on board that acts as a perfect solution for patches that employ cross-modulation between envelopes. Quadrax also brings traditional LFO behavior to the table, offering a multitude of continuously variable bipolar shapes to cover countless more modulation scenarios than its predecessor. Zoia is a much-anticipated pedal from Empress Effects. Simply calling it a guitar pedal would be a very misleading understatement. Zoia is a whole modular environment confined only by the limits of the user’s imagination. It is a development framework in a single pedal-shaped box that lets you create pretty much anything you can think of: synthesizers, sequencers, tremolo, reverb, delay, distortion, etc. Out of the box, it comes with around 80 modules that can be patched and connected in any way one might like to achieve more complex functionality. It is also one of those devices that promises to get better and better over time, as more modules are added. The spectrum of what Zoia can be and how it can sound is truly vast, and we can’t wait to see how people will be using it. Crucible is a new addition to the WMD’s line of drum/percussion modules. In only 8HP the module lets the user to synthesize any sound of metallic nature: cymbals, bells, gongs, sheet metal, and more. Following along the lines of the previous Chimera and Fracture, Crucible features a digital engine for creating percussive tones. Unlike the granular/sample-based Chimera and Fracture, though, the Crucible's sounds are entirely synthesized—it employs an extensive waveguide network to create everything from lounge cymbals and cowbells to impossible gongs that change shape and size in real time. The key element to Crucible is precision, evident in its starkly realistic sounds. At one point of the event, we actually thought that there was a drummer in the room striking a real cymbal. Obviously, since Crucible is a Eurorack format module, it features a great number of inputs for the control voltage sources, which really are the portals that can lead away from the familiar into the new exciting and unknown territories. The folks at Noise Engineering seem to be working on several new projects at any given time. The result is perhaps one of the largest selection of modules coming from a single manufacturer. At the Synthplex event, Noise Engineering demonstrated a few of their recent creations: Vox Digitalis, Kith Ruina, Sinc Bucina, and the magnificent Cursus Iteritas Percido. To those who are familiar with the brand, the strange-sounding Latin words—Cursus Iteritas Percido will actually make a lot of sense. Essentially, this module is a sequel to the Noise Engineering practice of turning their already amazing oscillator modules into complete drum voices. The previous example of such was the transformation of Loquelic Iteritas dual oscillator into the mind-bending Loquelic Iteritas Percido. Cursus Iteritas was always known as a gentler oscillator (if that word is even remotely applicable to the Noise Engineering universe). CIP features the same sonic core as the original Cursus Iteritas, yet it is expanded with internal envelopes, VCAs, and other control elements to make it a plug and ready-to-destroy-the-universe synth voice. Sinc Bucina is the follow-up to one of the NE first modules, Sinclastic Empulatrix. 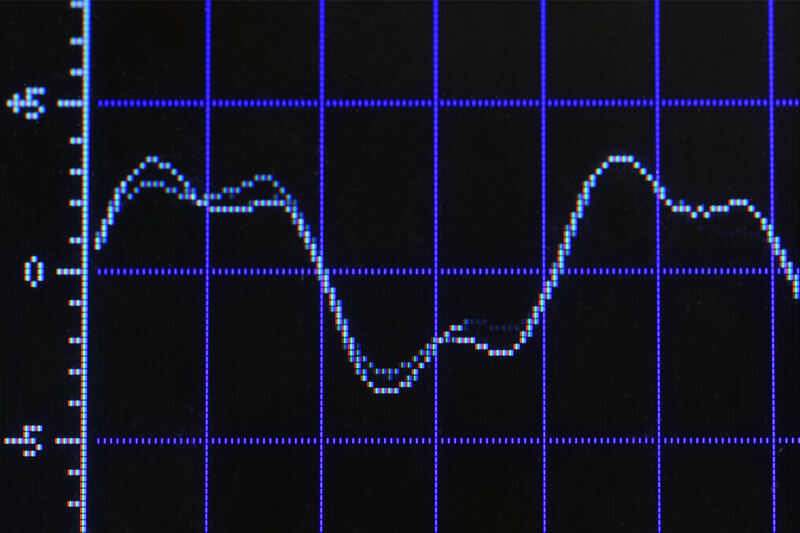 Categorically, the module lives somewhere between the plucky Low Pass Gate, and an ASR envelope. 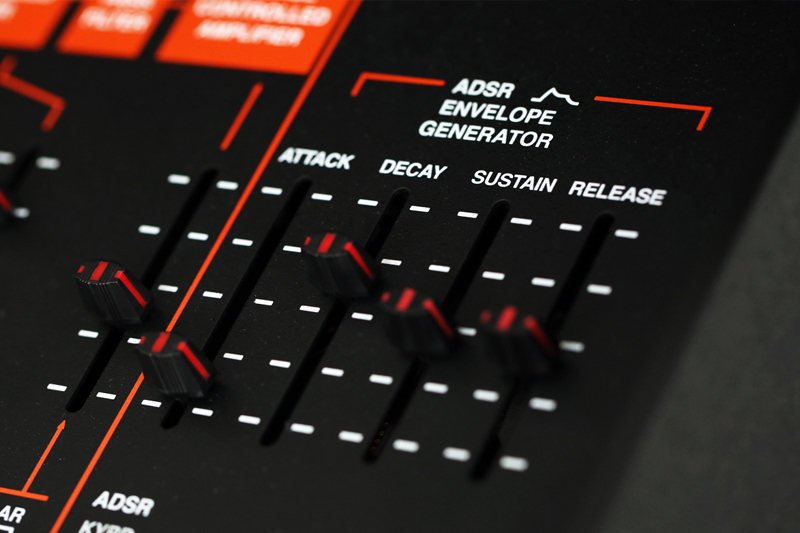 The envelope itself is available both internally, as well as via a separate output, which accommodates the overall versatility of the module and complexity of the patches where it is used. 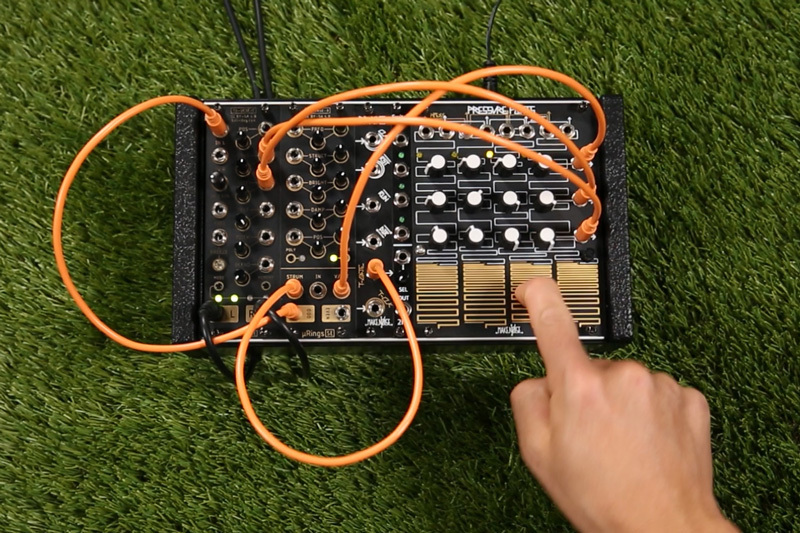 Continuing their line of sequencers, NE presented their newest Vox Digitalis module.  Unlike the cartesian Mimetic Digitalis, which excels at non-linear CV sequencing, Vox Digitalis is aimed to be a company’s solution for pitch sequencing, making it a great tool for those who still favor melody in music above other things. Finally, If you don’t know this already, Noise Engineering is also on a spree of making a different kind of distortion module every month. We’ve spotted a module named Kith Ruina at their Synthplex booth, which is about to start carving its place in the company’s arsenal of tools designed for total sonic annihilation. Blackbox is a new standalone music-making machine from 1010 Music. 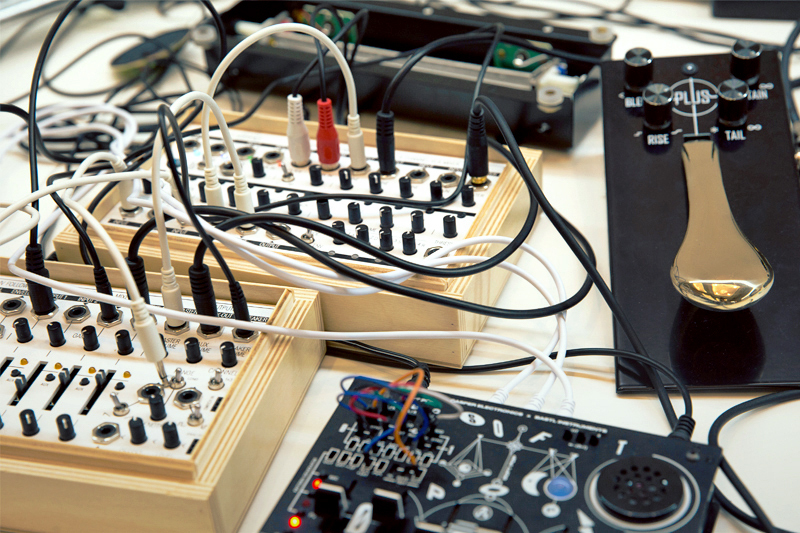 It follows similar aesthetics and the form factor of the company’s endeavors in the Eurorack format, particularly their Bitbox module. Being a stand-alone unit however, the Blackbox proves to be a simple to use, flexible sampler instrument that can be carried anywhere in a pocket. 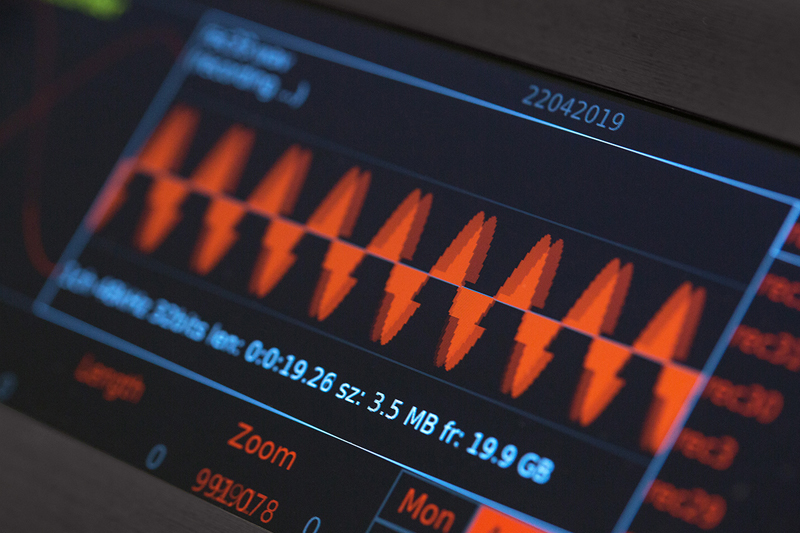 The unit features the same sensitive touchscreen as the company's line of Eurorack modules, creating an intuitive UI which allows users easily tap and edit sequences. Blackbox uses a high-speed microSD format for storing and reading samples, which works equally well for one-shots, long loops, and even complete several-minutes-long samples. The instrument seems to be especially relevant to artists and musicians, who are fond of the Ableton Live workflow, yet prefer to perform laptop-free. Although Blackbox is not a full-fledged DAW, it has all the basic necessary features for live performances, and beat-making. 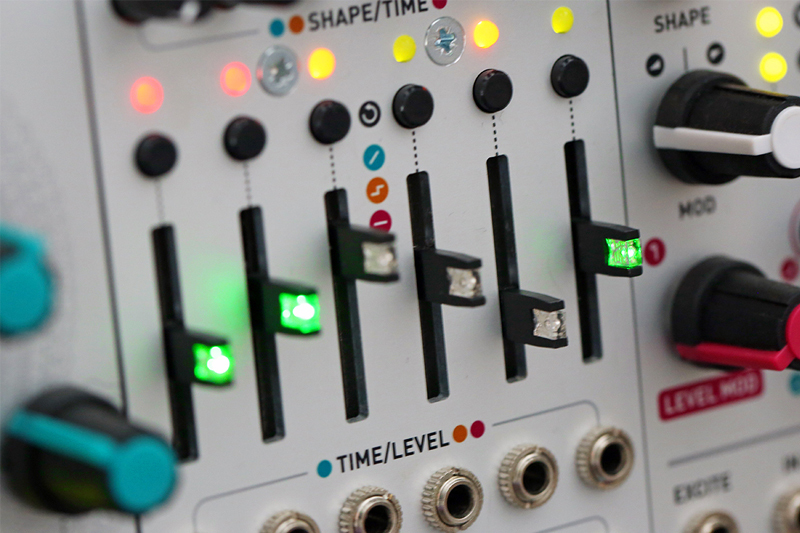 The module stores two internal effects, tools for on-the-fly sequencing and looping, and all the necessary connection ports to integrate MIDI controllers and other music making machines into the workflow. It looks like the essence of this machine can be easily summed up as “simple and fun." The Synthplex booth of Mystic Circuits was infused with inviting psychedelic vibes, and in a large sense, the responsibility for that falls onto the pool of morphing colors on the screen, produced by the Perfoscillator—the newest analog video oscillator engineered by the company. The oscillator is designed to fit into the LZX framework of video synthesis, however because of its simple transistor core design, it will pleasantly surprise all the video synthesis aficionados with a generously lower price point. Mystic Circuits also showcased another new product, the module called Portal. 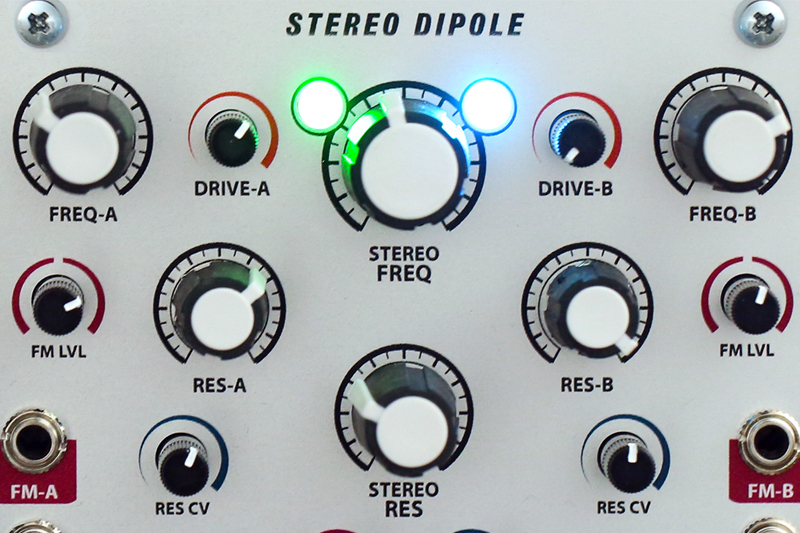 Essentially, Portal falls into the waveshaper/distortion family of sound processing modules. In concept, it is similar to the effects produced by wavefolding however, instead of the waves mirroring itself past the threshold point, it does a slightly different thing, a process that Eli calls wavewrapping. Hexinverter's Mindphaser is another entry into the ring of Eurorack-format complex oscillators—dual oscillator modules with extensive internal waveshaping and modulation options, opening the door to a huge array of timbres with just a handful of knobs and switches. Unlike the majority of such modules, which closely follow the lineage of the Buchla 259, the Mindphaser goes a step further into its own paradigm—offering phase modulation, feedback, and remarkably well-thought-out internal signal routing. It's one of those modules that you have to hear to believe...capable of everything from classic analog to digital-sounding basslines, crisp percussive sounds, and abrasive onslaughts of pure sonic violence, the Mindphaser is in a class all its own. It shall be noted that there is no way that we can mention everything that caught our attention or sparked inspiration during the four days of Synthplex. We didn’t even mention all the fantastic performances that were occupying the evening sections of the event. Personally, we simply appreciate the growth of synthesizer culture and feel grateful for being a part of it. We hope to see the evolution of the event next year, and as for now—back to patching!